We are the first and one of the few brokers that is currently offering CFD and FX trading on one of the most popular platforms in Germany. Guidants is a highly interactive, social way to trade within an intuitive interface, which you can use to trade over 1000 instruments in 9 asset classes through JFD’s pure Agency Model with 100% DMA/STP execution. 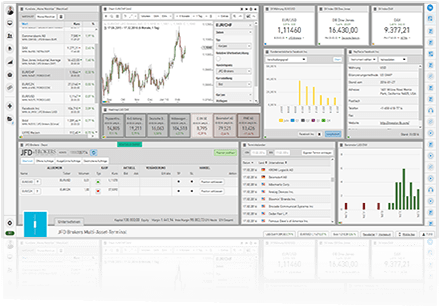 Guidants’ browser-based platform gives you the ability to create your own technical and fundamental approach with its customisable desktops and extensive array of free widgets. Backed up by JFD’s world-class IT infrastructure and ultra-fast connectivity, this sophisticated platform offers you a unique trading experience within flexible work spaces. With its advanced charting capabilities and beneficial tools, JFD’s Guidants meets every trader’s individual needs. Take your trading strategy to the next level. 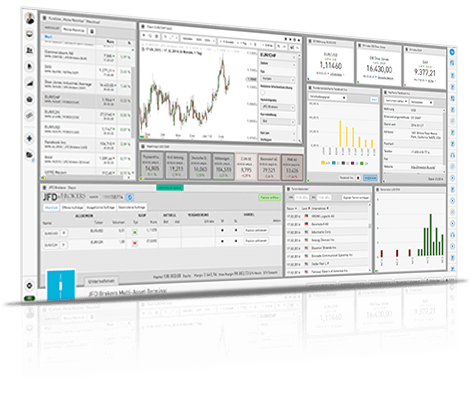 This platform’s claim to fame is its customisation, its reliable and extensive source of trading information, as well as its impressive charting tools. 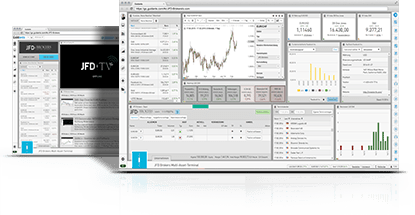 You will have the exclusive opportunity to trade both CFDs and Forex on this particular platform while making the most out of all the advanced widgets on offer. Guidants operates on a browser version, which means there is no software to download. You can conveniently access the 9 asset classes and 1000+ instruments that JFD offers on this online platform anytime, anywhere – all you need is a device that has a browser and internet connection. You can benefit from a unique feature within the Guidants platform that allows you to group different widgets into colour-coded sets, through which you can connect specific topics or instruments. Link the widgets by colour for endless connectivity possibilities! This ability to connect related elements makes information gathering clear and highly effective and allows you to monitor various markets simultaneously, so you can place trades swiftly and efficiently! This Desktop helps you stay in touch with your broker, experts and other traders. It will make your trading experience more interactive and social. Don’t miss our live broadcasts with market analysis and educational webinars. 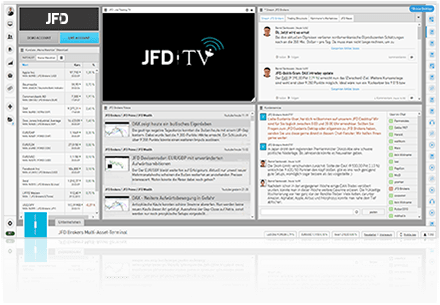 Find out what is happening on the markets from our JFD Stream. If you have missed something, find it in our archives on JFD Videos. This Desktop brings fundamental analysis to a professional level. It offers widgets synchronised in sets that increases the speed of trading, and the coverage you can get. 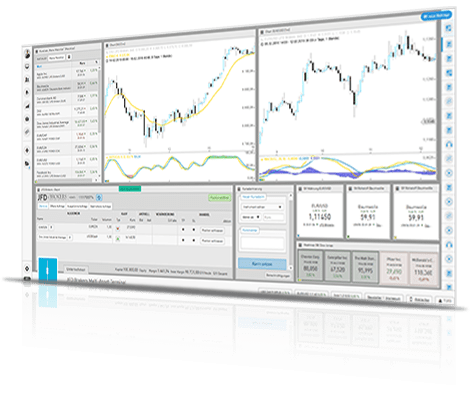 It allows you to make a review over a whole basket of shares or indices, and receive detailed fundamental data automatically, while at the same time monitoring your trades. This Desktop provides extensive charting possibilities, all of them easily accessible from the Chart. The combination of several instruments and indicators within one chart allows you to have a better look at the markets and make advanced technical analyses. Never miss important price levels with the help of the functional PriceAlarm widget. YOU HAVE A TRADING STRATEGY. WE HAVE THE PLATFORM TO REALISE IT. Watch our popular broadcast feed featuring trading analyses by world-class industry experts. Covering daily analysis of the forex market, real time trading ideas and educational webinars, our TV channel streams live to thousands of traders worldwide. Catch live analysis on real time events, as they happen! This widget has the full screen option but you can keep the window in compact mode so you can follow the live feed while trading. You can also access our live coverage at a later time as it is saved in videos on our YouTube channel, which can be accessed through the JFD Videos widget - this way you will never miss anything important! Our videos, already acquiring more than 40,000 views, also feature additional educational trader clips, multilingual webinars and more useful tips to help you grow as a trader. Keep up-to-date with the latest market news and trading shout-outs by following JFD on our RSS feed. Receive live notifications within Guidants, and also by email, of all our newly published info from our trusted JFD research experts. Make your own view of the markets heard by adding your own comments and interacting with our experts! 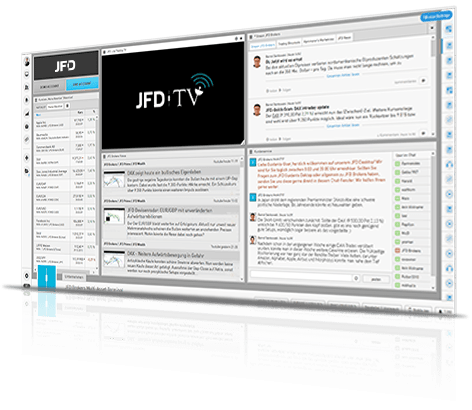 Thanks to this unique JFD widget you can directly interact with our international trading experts, ask them questions about their published articles and videos, and even communicate with JFD customer support should you need help with anything. The Chat feature is a great way to interact with other traders as well, receiving useful feedback, and sharing trading tips and opinions on what is happening in the markets. This widget offers a convenient view of your preferred instruments while at the same time allowing you to customise the data that is displayed. You have the opportunity to choose between 1-43 column values for any instrument and you can transform the WatchList anytime into a Barometer, Heatmap, and other widgets, such as TopFlop Table, according to your needs. A quick pop-up menu gives you the opportunity to set alarms, open charts and the order placing mask, and more. Gives you an overview about your account status and trades. You can monitor your trades, balance, equity, margin, profit and loss, or you can set new trades. Your open trades, pending orders, cancelled ones and closed positions are sorted in different tabs so you will never lose track of your trading strategy. There is a button for opening the order placing mask as well. All indicators are integrated and easily accessible directly through the chart. Ten different chart types, as well as correlation charts, are available. You may save your preferred charts, customise the colours, use templates or logarithmic scaling. 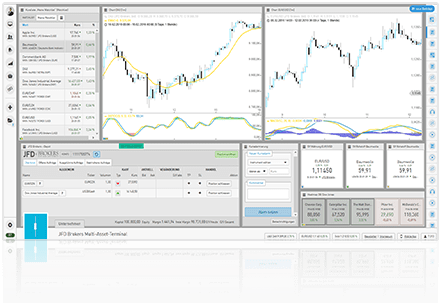 The option to pre-set loading rules and include the chart widget in a set allows you to open an exact combination of charts with the right time frames and settings, with a single click on a preferred instrument. Keep an eye on the hottest instruments in a particular group. Heatmap can be included in a set with a list of indices for example, so that with a single click, you can see which stocks are the best and worst performers. A quick pop-up menu gives you the opportunity to set alarms, open charts and the order placing mask, see news and more. Put any instrument, sector (or index that combines many instruments), into a Shortview where you may choose if you want to see the Bid or Ask price of the symbol. As with other widgets, the pop-up quick menu appears just by hovering your mouse over an instrument allowing you to open charts, set alarms, open the order placing mask, see news or more info about the instrument. Gathers the most important fundamental parameters and statistics for any selected share in one place. Just select from the drop-down menu the information you need for the selected share to see it in the form of a chart or table. Switch between chart and table view with the ‘Chart’ button. With the help of this widget you can receive key facts, like information about the management team of a company, ownership distribution or the main industry the company specialises in, for any selected share. Choose the share from the menu and select the required information from the dropdown menu. Scales the stocks from a certain index or sector according to their performance. Use the Multi-Screen option available on this and almost all of the other widgets to allocate them in your preferred way. From the action menu of the widget you can transform it anytime to either Heatmap, WatchList or any other widget. The bars in the chart are clickable and present the stocks which have similar performance in tables. From the action menu of the chart you can select preferred regions or categories which are important to you. The Calendar Widget can also be connected in a set and personal events set up to help you trade the fundamentals. In order not to miss when important price levels are reached, the trader may set price level alarms. You may leave comments for a trade or chart formation, and set up to be reminded with the activation of the alarm. A drop-down menu gives you the opportunity to select the direction of the price movement or to set a break-out range. Is it possible to trade directly in Guidants through my JFD account? In Guidants, you can not only observe, analyse and discuss the market, but you can also trade live - an option which is available for all JFD clients. In fact, we are the only retail broker empowering all our clients to buy or short sell up to 9 asset classes (1000+ instruments) using the Guidants web-based platform through our pure Agency Only model. Do I need another account in addition to my MT4+/MT5+ trading account? No. With our multiple platform - 1 account set-up, no new account is needed and you can use your existing JFD account directly to access the Guidants platform. Where can I see the commission charged? Where can I find the swap rate? What market price is used as a basis for the candles/bars/lines etc.? Can I use my MT4+/MT5+ Indicator or EA in Guidants? No, it is not possible to use any MT4/MT5 EAs, indicators, templates, or other customised files in the Guidants platform. 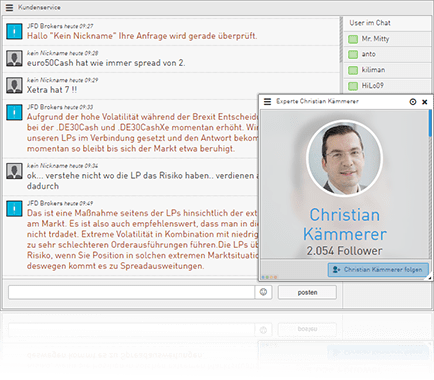 How safe are the login details of my live account when I log in through this web-based platform? The entry of the login credentials takes place on a SSL encrypted version of Guidants. An agreement to the Terms and Conditions is required. However, your personal information is not stored on Guidants. All sensitive data pertaining to your account is held exclusively with JFD. Is the pricing on Guidants in real time and how can I switch to real-time quotes? The quotes are available by default in real time. This can be verified with the Real-Time button, which should be lit up in green. The button can be found in the left navigation bar just below the gear icon (bottom left of the screen). If you want to disconnect from the real-time quotes and to receive exchange courses with a 15 minute delay, then simply click on the Real-Time button. The red light will indicate the delayed quotes. What range of capabilities do I have as a Basic Member, and what range do I have as a Guidants PRO member? To actively use Guidants, you need to be a BasicMember , which is free. This will enable you to use the most important of all of Guidants’ functionalities (e.g. to trade, save charts, desktops, watch lists and write comments). With Guidiants PRO you have a few added benefits, such as increased storage capacities, access to additional widgets, and more. What is the Guidants Market? The Guidants Market is the central page, from where you can load a widget or a desktop. There, as well as on our Guidants User Guide you can find a review of all widgets and the different pre-set Desktops with short descriptions (detailed descriptions of all widgets can be found in our Guidants User Guide). Guidants is designed for the following browsers: Google Chrome, minimum Internet Explorer 9, Mozilla Firefox and Safari. In order to guarantee proper functioning of the platform, please make sure that you have the latest version of your browser installed. How do I load and display a widget? Click on the icon showing the small monitor in the top menu bar. This will open a new, blank desktop. Now click the Market button to open the Guidants Market . The Guidants Market menu is located on the left side. Click on Widget to get an overview of all widgets. Now select those widgets which you want to load onto your desktop. To do this, click the plus (+) sign. Repeat this process for each widget you want to load. For some widgets you still need to determine the value to be displayed in the widget. Just click on the menu bar (in the upper left corner of the desired widget) and then on Select Instrument (Instrument wählen) . This opens an input window, into which you enter the desired value or its initial letter. After you have loaded your desired widgets on your Desktop, you can connect them by grouping them into a set. To do this choose the same colour in the lower left corner of each widget. If you want to have more than one colour-coded set please use another colour for your next group of connected widgets. Now, by clicking on a specific topic or instruments within a set, you will automatically see the related topic/instrument in the connected widgets. If you want widgets to remain connected but only in one direction (i.e. to send data, but not to receive any), select Widget from the action menu, then choose Connect with Set (mit Set verbinden) , followed by Receive Data (Daten empfangen) . Note: Some widgets (such as charts) can receive data from others, but cannot send data. Where do I find my Desktops? All your own customised Desktops are stored in the sidebar under the screen icon. Click on the desired Desktop to open it. Can I change the background color of the chart widget? No, this is not possible as the colour of the chart adjusts automatically to either the light or the dark theme of Guidants. However, it is possible to create a standard template for the chart. This template will also save your preferred selected background colour (from a choice of only black or white). To find out how to save a default template, please refer to our Guidants User Guide. I am already a client of JFD, how can I register for or login to Guidants? If you are an existing JFD client, simply go to Guidants’ website to register or log in. Should you have any other questions, please contact our friendly and very experienced Client Service to assist you in using the Guidants platform. How can I download Guidants? The Guidants platform is only web based, so you do not need to download or install any files. Once your registration process is complete, you will receive an email containing the link for the Guidants Platform. Can I use Guidants on a Mac? Yes, Guidants is a web-based platform.